betusracing is an online betting hub that offers you one of the best racebooks in the world. The site went live in 2014 and has since been accessible on desktop computers and mobile devices. It runs with a 256-bit Secure Sockets Layer (SSL) encryption which gives you assurance that hackers will find it impossible to crack the site’s database. The bookie holds a license from Curacao – a proof that it is running legally. Unfortunately, players from several countries cannot sign up with the sportsbook. Some of the countries on the list of restricted jurisdictions are the United Arab Emirates, Costa Rica, and France, to name a few. Is betusracing a bookie you should sign up with? Read this review to find out. Deals such as welcome bonuses, cashbacks, and referral rewards are up for grabs on betusracing. Read on to know more about the sportsbook’s bonuses and promos. 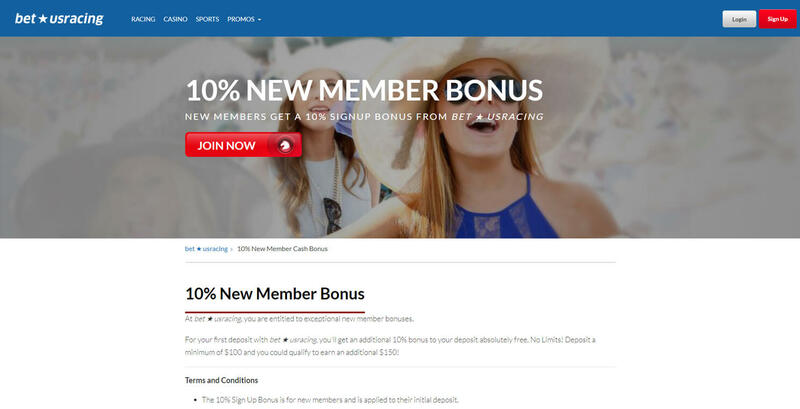 When you sign up with betusracing, you get a 10% welcome bonus on your initial deposit. To receive the deal, you must deposit at least US$100 into your account. The site will credit the reward to your player account 10 minutes after you make your first deposit. You must roll over the sum of your initial deposit and bonus one time. If you fail to do this, betusracing can forfeit your bonus and the winnings you accrued using it. You can get another welcome promo with betusracing’s US$150 Cash Bonus. For you to qualify for this deal, you must have deposited a minimum of US$100 and wagered US$500 within your first 30 days onsite. You will receive the US$150 instantly once you qualify for the promo. Before you can cash it out, though, you must first rollover the bonus once in the racebook. betusracing offers you a weekly 50% cashback promo. This deal applies to the losses you incurred on the site’s casino during Thursdays from 12:00 a.m. to 11:59 p.m. EST. The 50% rebate of up to US$100 will be returned to you on Friday at 11:00 a.m. EST. You must wager the cashback amount 10 times in the bookie’s casino section before you can cash it out. However, playing games such as craps, roulette, baccarat, and pai gow will not count toward the rollover requirement. When you refer your friend, or anyone you know, to betusracing, you can get a 25% deposit promo up to US$250. To qualify for the deal, your account should not have any violations against the website’s rules. You should fill out a short form asking for your friend’s name and email. When your referred individual consents to opening an official player account with the site, you will receive a bonus whose amount depends on how much your referral will deposit into his/her account. Before you can cash out the deal, you must first wager it five times on the website. Also, if your friend refunds the deposit and deactivates his account, your bonus will be voided. 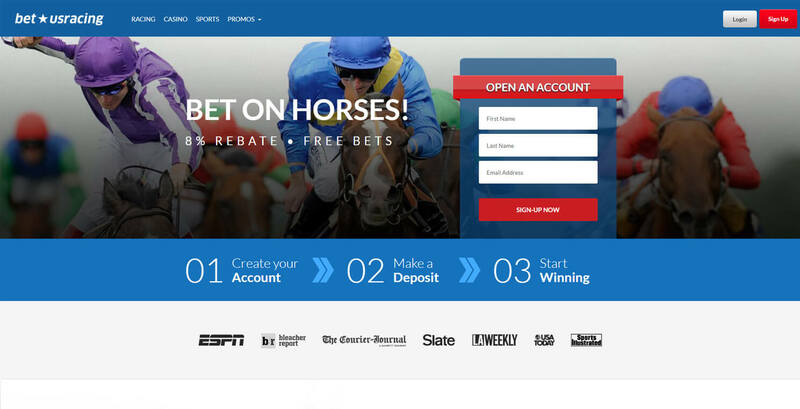 Other than these promos, betusracing offers a Horse Betting Rebate deal that can give you a cashback of up to 8%. Promo codes that grant different bonuses are available on the site as well. betusracing offers over 10 sports you can place your bets on. Since this bookie claims to be more of a racebook, it prioritizes horse racing over other sports. Despite this, the bookie still offers different ball games such as basketball, baseball, football, and tennis. You can also bet on different esports like League of Legends. Other than sports, the bookie has entertainment, religion, business, and politics sections you can wager on. There are different betting types you can choose from. These are straight wager, parlay wager, if bet, and reverse wager, depending on your chosen sport. Other than being a bookie, the site is a casino. You can play video slots and table games such as craps, blackjack, and poker onsite. There are keno, bingo, and virtual racebook titles available as well. betusracing accepts fiat money and cryptocurrency. The specific crypto coins supported are BTC, BCH, and LTC. However, the only fiat currency you can use is USD as the site is mainly for US bettors. The sportsbook does not set any deposit limits for most methods except for MoneyGram which requires you to deposit at least US$100. Before you can load up your account, on the other hand, you must first contact betusracing’s customer service to confirm your transaction. You can withdraw any amount from your player account. However, you have to wait up to 48 hours for the approval of your withdrawal request. If you did not receive any confirmation, you have to contact betusracing’s customer service. betusracing: Is It Worth It? If you are a fan of placing wagers on horse racing, betusracing is a great site to do that on. 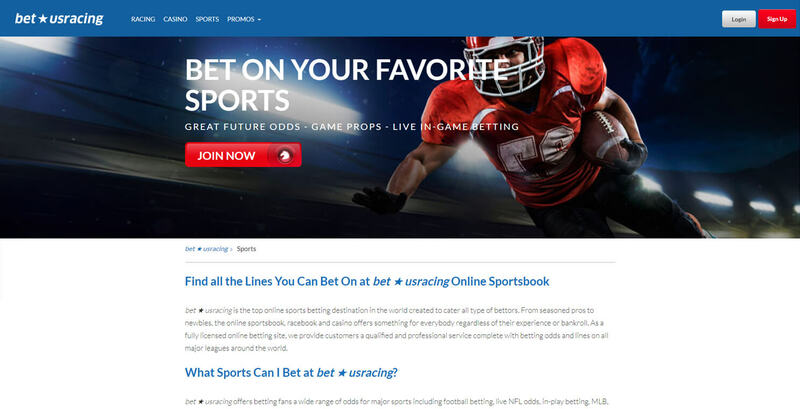 The site’s dedication to becoming one of the best racebooks in the world is reflected in its available betting options. Another plus for the website is that even though it focuses mostly on horse races, it still has other sports you can place bets on. Plus, the bookie has interesting bonuses and a casino section which will entice you to place wagers. On the other hand, the setbacks of the site are its limited payment methods. These limitations are mostly with the sportsbook’s few withdrawal methods. Another downside is its lack of fiat money support. It supports only USD which may turn you off if you are using another currency. But this should not be a bother if you find transacting with online exchanges easy. All in all, if you are a fan betting on horse races and cashback promos are your fancy, signing up with betusracing is a must. But if you prefer a site with wider choices for placing wagers on, this site is not for you. It is best for you to check out other sportsbook reviews to find one that suits your taste the most.